Schipperke dog breed is known for over four hundred years in Belgium. The Schipperke (pronounced skipper-key) is most likely a descendant of the black sheepdog that was also the predecessor of the later Belgian Sheepdog variety known as the Groenendael. While the latter was bred larger, the Schipperke was bred down in size. The smaller Schipperke breed was favored by Belgian canal boat owners and some think its name came from the Flemish term for “little captain.” More recent research indicates the breed name actually means “little shepherd,” and in Europe, the Schipperke dog breed is classified as a sheepdog for exhibition purposes. Guild workmen who took the little dogs to heart are known to have exhibited the breed in 1690, at a show held in the Grand Place of Brussels, that was judged for the dogs’ hammered brass collars. The Schipperke is an excellent and faithful little watchdog, a hunter of moles and other vermin, he seeks the company of horses, can be used to hunt and is a good rabbit dog. 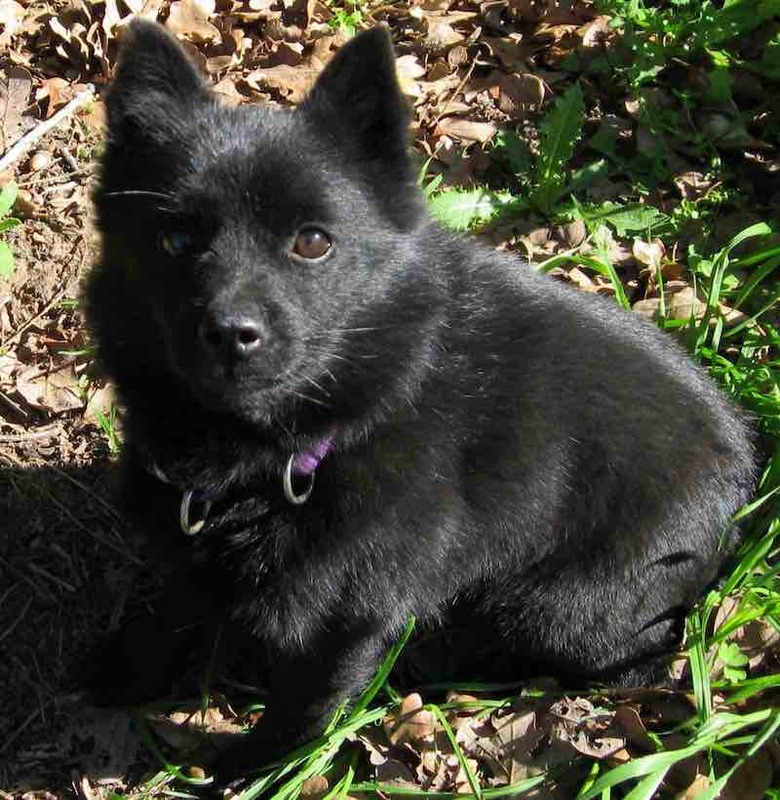 Schipperke Temperament: Bright, active and inquisitive, the Schipperke is fond of children and makes a fine family pet. He is an excellent protective watchdog, quiet unless alarmed. He is a good ratter, yet sociable with other animals. He has an independent streak, although he is intelligent and highly trainable. 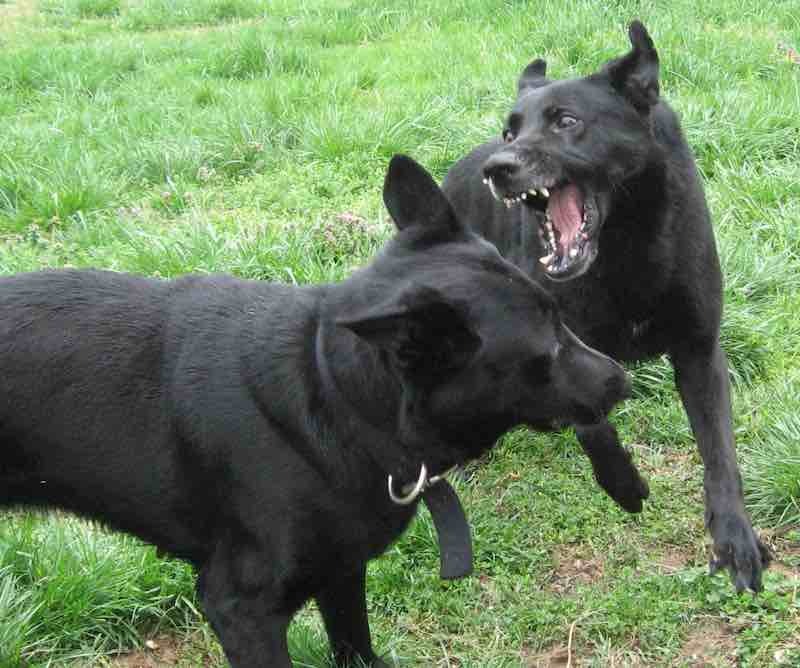 Trained properly, the Schipperke is a quick and accurate worker in obedience, tracking, scent work, and agility. 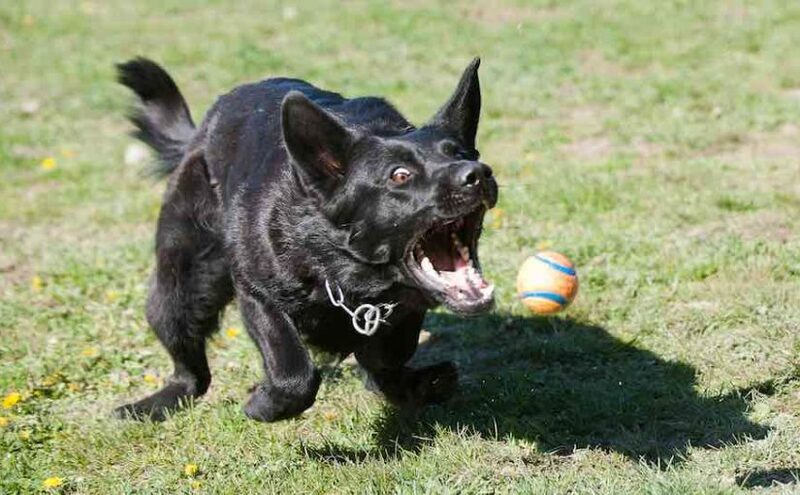 A big dog in a little package, a Schipperke is able to cope fearlessly in almost any situation. General Appearance: The Schipperke should have a short, thickset cobby body with hindquarters slightly lighter than the foreparts. The head is fox-like and the expression is questioning, sharp and lively, not mean or wild. The distinctive black coat, ruff, and tailless rump give a unique silhouette to the small dog. A natural tail should not interfere with his prized silhouette. Schipperke Size: 12-18 lb. (5.5-8 kg). Coat and Colour: The coat must be black, abundant, and slightly harsh to the touch, short on the ears, front of the legs and on the hocks, fairly short on the body, but longer around the neck, beginning back of the ears and forming a ruff and cape which give the appearance of the withers being higher than the hindquarters, and a jabot extending down between the front legs. The coat is longer on the rear where it forms a culotte, the points turning inward. The undercoat is dense and short on the body, very dense around the neck making the ruff stand out. The culotte should be as long as the ruff. 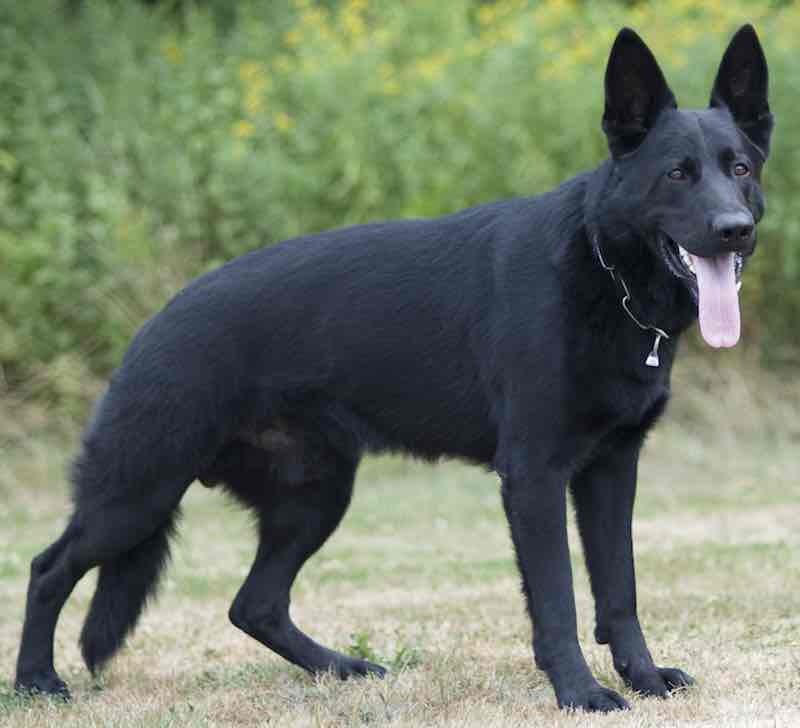 Head: Skull fairly wide, narrowing at the eyes, when the ears are up in the alert position, the correct skull in the profile will appear flat. Muzzle tapering, not too much stop. The length of the muzzle from tip to stop is equal to the length of the skull from the stop to the occiput. Nose small and black. Mouth: Teeth strong and even, a level or scissors bite acceptable. Eyes very dark brown, small, oval rather than round, neither sunken nor prominent. Ears very erect, small, triangular, placed high, strong enough not to be capable of being lowered except in line with the body. Neck: Strong and full, slightly arched. Forequarters: Shoulder muscular and sloping. Legs straight, well under the body, with bone in proportion to the body. Pasterns straight. Dewclaws may be removed. Body: Back strong, short, straight, and level. Chest broad and deep in the brisket, ribs well sprung, broad behind the shoulders. Loin muscular and well drawn up from the brisket but not to such an extent as to cause a weak and leggy appearance of the hindquarters. Croup slightly sloping, rump well rounded. Hindquarters: Lighter than the foreparts but muscular and powerful. Thighs muscular and powerful. Hocks well defined. Metatarsus short. Feet small, round, and tight (not splayed), nails straight, strong, and short. Dewclaws may be removed. Tail: Docked to no more than 2.5 cm (1 inch) in length or any type of natural tail. Gait: Unrestricted, free, and vigorous. 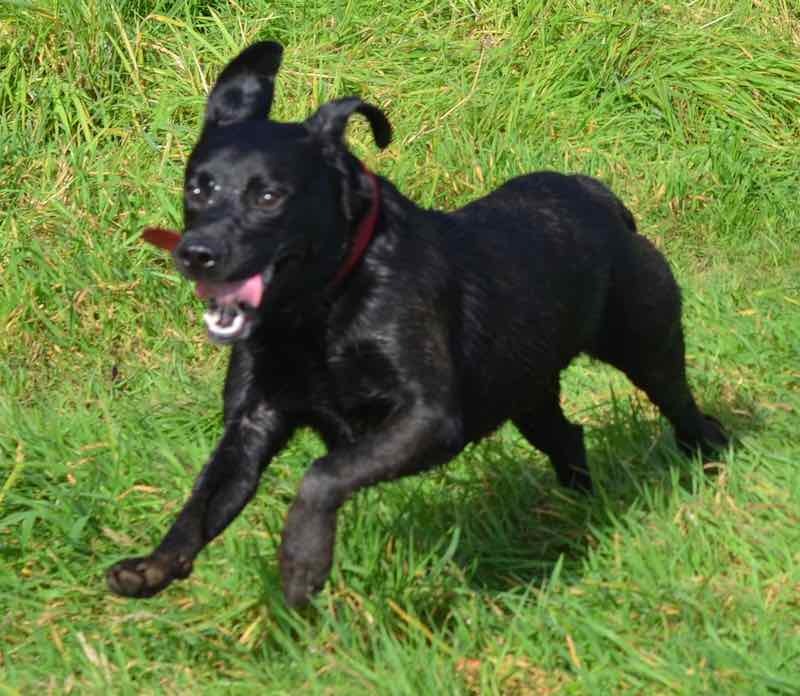 The Schipperke is tireless and quick to move in any direction. 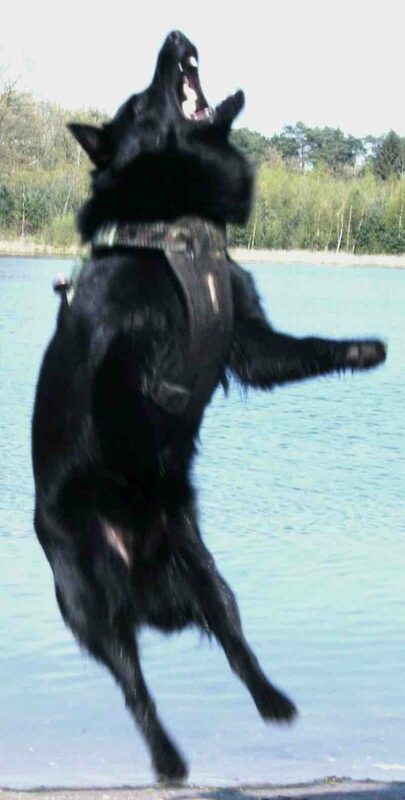 In a correctly proportioned and angulated Schipperke at a trot, the feet and legs converge as seen from the front or the rear, and each hind foot falls on or ahead of the print of the forefoot. Faults: Any deviation from the standard is considered a fault. Disqualifications: Any color other than solid black, drop or semi-erect ears, overshot or undershot mouth.